Congratulations to "Nikki", the winner in Jacki's giveaway. Thank you to all who participated! Developing a book trailer starts with a script. This can be the book cover copy (also called the book blurb or book summary), an excerpt from the book, or something entirely different. For A CODE OF THE HEART, we used a brief excerpt that reflected the storyline, plus the tag line for the Code Breakers series. The script can either be narrated or added as text. The next step in the process is to assemble the graphic and audio components. This can be a challenge, as you must comply with copyright laws. You must have permission or be authorized to use the content in your trailer. To avoid any problems, we either use images owned by myself or the author, or stock art/music that has been purchased. You can also use material under a Creative Commons license. Finding licensed images for Regency romance can sometimes be a challenge. One of the images we considered using for this book trailer was discarded when we realized the male model–posed in a classic historical romance cover embrace–was wearing a gold chain necklace. We didn’t want any readers complaining about the historical inaccuracy of such an image so we selected a different graphic. Another way to solve the problem of limited Regency England images is to look for photos that reflect the story elements without specifically portraying them. For example, in this book trailer, the “spilled” tea cup represents the poisoning, danger and betrayal incidents in the story, while the British flag was selected to signify the intrigue and danger to the British monarch. The audio and video elements are crafted into a final product using Windows Movie Maker and an audio “mixing” program called Audacity. For an audio sample of my new audiobook, listen HERE. I hope you enjoyed learning about what goes into creating a book trailer and that it has made you curious to learn more about my Regency romantic suspense! If you’d like more information about my audiobooks, you can find A CODE OF LOVE and A CODE OF THE HEART on Audible, Amazon and iTunes. Tell me what you enjoy most about audiobooks for a chance to win a copy of my new audiobook release, A CODE OF THE HEART. Giveaway ends 11:59pm EST Aug. 2nd. Please supply your email in the post. You may use spaces or full text for security. (ex. jsmith at gmail dot com) If you do not wish to supply your email, or have trouble posting, please email maureen@justromanticsuspense.com with a subject title of JRS GIVEAWAY to be entered in the current giveaway. What a great inducement to keep you exercising! Thanks for your insight! Being able to multi task whilst enjoying a book is what I enjoy most about audio books. I used to feel so bad about neglecting housework by spending hours reading. You can imagine how happy I was after I downloaded my first audio book. Audios are a guilt free way of getting through my TBR list. I also find that I can picture the story better when I am listening as the pace is slowed down and my brain isn't taking in the written word at the same time. My narrator,Pearl Hewitt, is amazing and I'm always surprised how different the book feels when I'm listening versus reading as you described. Thanks, Angi. Pearl Hewitt's voice adds A LOT to the trailer! Thank you everyone for commenting and good luck in the drawing. 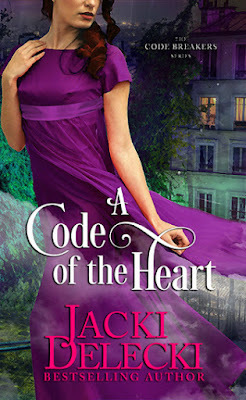 And many Thanks to Just Romantic Suspense for hosting A Code of the Heart.